Sorry for late answer, but I was outside of me office. Yes, I excavated mass grave territory in Marijampole in 1996. The purpose was to finde exact place of the graves. The supposed burrial place was emty and I found the mass graves about 100 m outside of this supposed territory. People were kiled and burried in a big dich. But after finding the exact place, my work was over. I don't know how much people were kiled and how big the mass grave territory. So the mass graves had not been investigated in detail as I had presumed, but the survey had been limited to establishing their location in order to place the intended monument there. I further inquired about the report on the results of this survey, asking Dr. Merkevicius to send it to me (17 June 2003). Dr. Merkevicius responded on 25 June 2003 that he could send me the report upon his return from an excavation, but that I would find "very little information about these graves" in the report. I didn’t receive the report, and I also didn’t insist much further, considering what I had been told about the report’s expectable contents (very little of the information I was looking for), and that the case had been made anyway: "Revisionists" who had crowed about the supposed absence of mass graves had made fools of themselves and shown what poor researchers they are. In other words, the respectable public servants of a European city and a renowned archaeologist are supposed to have shamelessly lied through their teeth, putting their reputation at risk by inventing mass grave finds they didn’t make and having a monument erected at a place where they had found nothing. Not exactly the most realistic of propositions, except perhaps for Mattogno, who tries to bolster his conspiracy theory with two fully transcribed/translated 2008 press articles about further developments regarding the "controversial" Marijampolė mass graves. The narrative of these two articles is very similar. The mass graves of the September 1941 killings lie on a bend of the Šešupę river that used to house a czarist-era military town. The Soviets later erected military equipment storehouses and an ammunition warehouse and made embankments at the same site. After the demise of the Soviet Union, the buildings became Lithuanian state property and were later bought by a private company, which obtained the municipality’s permission to take down the buildings "without prior coordination with specialists of the Department of Cultural Heritage". Human bones were found when tidying up the area and dismantling the concrete pavement, revealing that the mass graves were partially located below the buildings. Even though construction works were halted at once and bones lying around on the ground were all gathered (at the request of Jewish community leaders), "any larger downpour of rain washed new bones afloat to the surface". The municipality’s official in charge announced that there would be no more demolition works on the burial ground site. Now, what does Mattogno make of this? The likeliest answer to this question is that a part of the mass grave area sufficiently large for detection by probing excavations or other invasive means was not covered by buildings, and as concerns what was below buildings non-invasive survey methods may have been used. Mattogno’s next question is why, in his correspondence with me, archaeologist Dr. Merkevicius mentioned no buildings at the site of his survey. Given that (as Mattogno knows) the archaeologist just sent me two very short messages, this is not exactly the most pertinent of questions. By the way, the two long buildings that used to be by the side of the memorial, still visible on the upper Google Maps image below, are no longer there (lower image). It might be interesting to know what happened at the site since October 2012, when the upper image was taken. Mattogno tries to make the most of the Soviet-era buildings visible on the upper image above. He submits the hypothesis that the Soviets may have erected military buildings at the site not because it seemed appropriate for the purpose (after all a czarist military town had been located there) and they didn’t care much about buried Jews (at Babi Yar their indifference/contempt had gone to the lengths of dumping pulp into the ravine and planning to put up a housing development or an athletic center there), but in order to cover up a crime of their own. In support of this possibility (which as far as I know would have no equivalent at any other Soviet crime site), Mattogno refers to a 1999 press article whereby skeletons of people killed by the Soviet NKVD had been found in Marijampolė. What Mattogno doesn’t know, or doesn’t care to know, is that Soviet crimes against Lithuanians have been exhaustively investigated since the 1990s, and the state of knowledge allows for determining with great precision who did what, where and when. Marijampolė Municipality is no exception to this rule: it commemorates the victims of both Nazi and Soviet crimes. The victims of the Soviet regime were buried in the cemetery near Varpas str. in 1944-1953. In the years of Lithuania’s national revival wooden roadside memorials were erected and a Peace Park was established in that place. A country that suffered Soviet rule for decades and lost far more of its core population (as opposed to minorities like the Jews) to the Soviets than to the Nazis, Lithuania is not the kind of place where one would risk passing off victims of Stalin’s regime as victims of the Nazi occupiers. 1. Testimony of Jurgis Maksimovas taken on 4.10.1944 by the Soviet Extraordinary Commission. The shootings, according to this witness, took place at 8 pits. "In August, 1941, under orders of the German command, the police of Marijampole Uyezd committed a mass raid against the Jewish population of the Marijampole Uyezd. All of the police, including me, were directed to settlements where we took away all the Jewish families, including babies, put them on carts and convoyed them to Marijampole. For three days of the operation we arrested and convoyed about 7,700 of the Jewish population – women, old people, men and children of all ages. We had guarded the doomed to death for three days, not giving them any water or food. "Before the execution the doomed to death were locked in stables. ...After the prisoners were searched, the strongest men were chosen to dig pits. Eight pits were dug, two of them 150 m long, 5 m deep and 4 m wide, and the other six 100 m long, 4 m wide and 5 m deep. After all the Jews were undressed and were left in underwear, the execution began. First men were shot in groups of 100–200. As soon as the men were shot, women and children of all ages were executed in the same way. In the course of the execution many were wounded and then shot by single shots from rifles, and many of them were buried alive, as a result the ground was moving for some hours after the corpses were buried…"
3. Testimony of police officer Vincas Urbanavičius taken on 2.12.1944. At the end of August 1941, according to this witness, the Jews of Marijampolė together with those of Liudvinavas, Kazlų Rūda and Kalavrija were locked into army horse stables. To avoid such danger is necessary to place another soil cover on the Jew graves by the barracks area, because on the one hand due to the rainwater flowing off, and on the other hand due to the high water (the graves are right on the banks of the Sesupe river and are covered with a soil layer only 50 cm high), the cover is washed off and the corpses are laid bare. The preventive measures necessary for this purpose shall be carried out by the Local Headquarters’ own work force. In response to the Board’s letter No. 20260 I report that the mass graves, which used to be flooded by the incoming Šešupę [river], have been dried by moving them to a higher location. There are currently no untidy mass graves. The aforementioned evidence fully corroborates the Jäger Report as concerns the large Marijampolė massacre. 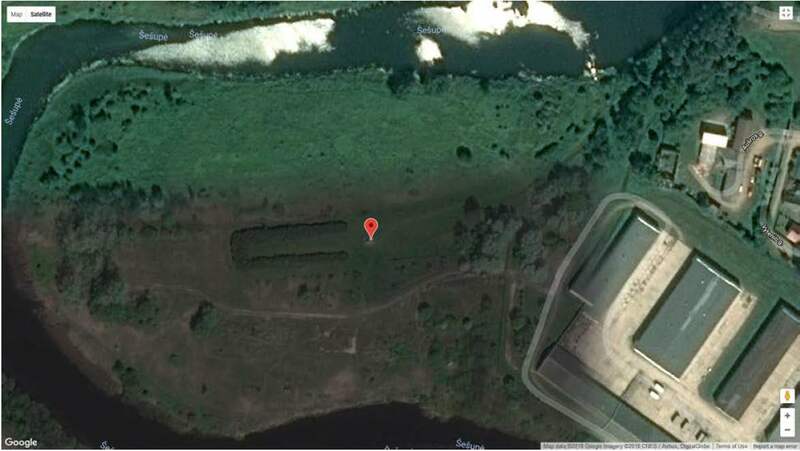 The cited correspondence shows that the graves were located a) right on the banks of the Šešupę river and b) by a "barracks area", which was obviously the barracks of the czarist military town mentioned in the 2008 press reports. The witness Pavlaitis, quoted above, as well as the witness Urbanavičius, cited by Dieckmann, testified that before the massacre the victims had been herded into stables (Urbanavičius with the precision that the stables had been army horse stables). It stands to reason that these stables pertained to the old czarist military town, made at a time when horses still played a major part in military life. So these witnesses and the authors of the aforementioned correspondence were referring to the same site. All mentioned testimonies point to a very large massacre, with victims in the thousands and not just in the hundreds. A reference to earlier, smaller massacres mentioned in the 2nd Jaeger Report can be ruled out, as these massacres happened at least more than a month before the date of the massacre recalled by the cited witnesses, and moreover took place elsewhere in the Marijampolė area. Thus there is no room for reasonable doubt that the mass graves mentioned in my correspondence with Marijampolė Municipality and Dr. Merkevicius pertain to the massacre mentioned in the 2nd Jäger Report under 1 September 1941, that the memorial was set up in the right place, and that the massacre it commemorates actually occurred. The number of victims written on the memorial stone may be too high (the actual number was 5,090 and not 8,000), but the order of magnitude is in line with the facts. It was not a small massacre, but one of enormous proportions. What is more: if, as suggested by the letter of the Marijampolė Head of County dated 26 October 1942, corpses were removed from the original graves and placed in secondary graves higher above the Šešupę to keep the corpses from being laid bare by floodwater, this might help explain why the 1996 archaeological survey found no corpses at the originally expected place(s). Witnesses to the massacre might have recalled the site(s) of the killing but not the site(s) to which corpses were later moved. So much for Mattogno’s Marijampolė Mass Graves Controversy. Further information about the Marijampolė mass killings will be posted as it becomes available. Below are facsimiles of the contemporary administrative correspondence about public health matters mentioned in this article. Report by the Sanitation Department of the Wehrmacht Local Headquarters in Marijampolė, Lithuania, dated 3.4.1942. Source: LCVA (Lietuvos Centrinis Valstybės Archyvas = Lithuanian Central State Archives), R-678-1-3-42. Publication of this document requires prior written permission. Any publication of this document must mention the full name of the institution: Lietuvos Centrinis Valstybės Archyvas (Lithuanian Central State Archives), and the archival reference. 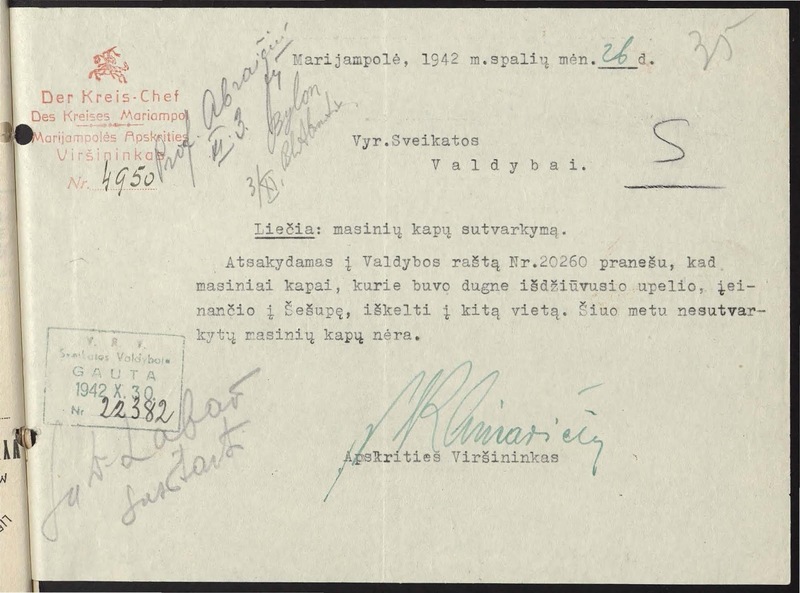 Letter sent on 26 October 1942 by the Head of Marijampolė County [Administration] to the Main Health Board. Source: LCVA (Lietuvos Centrinis Valstybės Archyvas = Lithuanian Central State Archives), R 627-1-150-35. A Google Maps image of the memorial site as it looks at present was added. Replying to letter No. 20260 of the Board, I let you know that the massive graves, which were located at the bottom of the dried brook, entering the Sesupe river, were transferred to the other place. Today there are no graves, which are not arranged. Replying to the Board's letter No. 20260, I inform you that the mass graves, which were located at the bottom of the dried brook entering the Šešupę river, were transferred to another place. There are currently no mass graves that are not arranged. Gesamtaufstellung der im Bereich des EK. 3 bis zum 1. Dez. 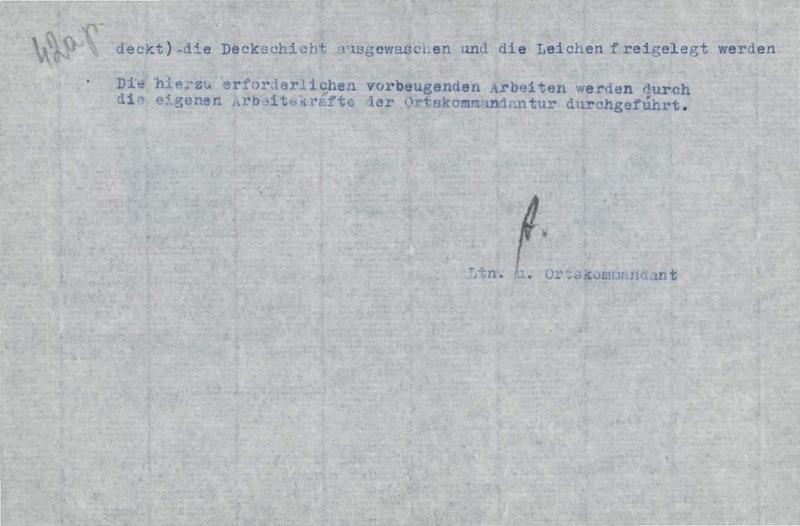 1941 durchgeführten Exekutionen (Yad Vashem Archives, Record Group O.53 - Ludwigsburg, USSR Collection, File Number 3, pp. 88-96). The former The Holocaust History Project website featured a transcription and a translation (links to respective first page, from where the following pages can be accessed; a facsimile of the respective original page can be accessed from each page). 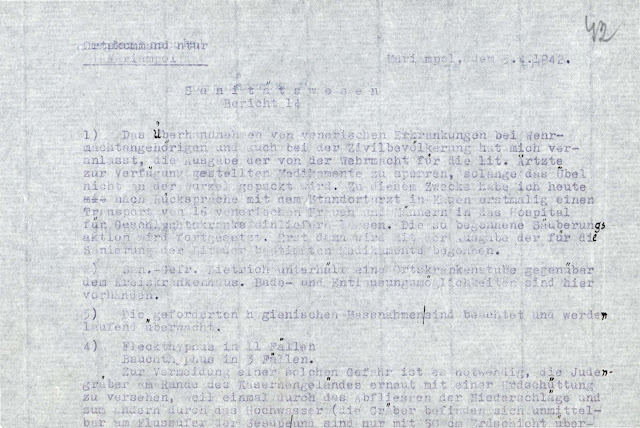 This was the second report written by Jäger, following an earlier report dated 10.9.1941 (YVA, Record Group O.53 - Ludwigsburg, USSR Collection, File Number 3, pp. 83-86). As of this date, a place search for "Mariampole" in the Yad Vashem Names Database yields 3,521 results. A search for "Marijampole" yields 4,958 results. Quotes in Sergey Romanov’s article That's why it is denial, not revisionism. Part II: Deniers and the graves of Marijampole. The Mayor’s letter and my subsequent correspondence about this matter are reproduced in the HC Reference Library thread Mass grave(s) at Marijampole. The monument can be viewed on the Marijampole Municipality’s website, with the following caption: "In the valley of the Sesupe river 5090 Jewish and people of other nationalities were killed in 1941 by Nazi forces." Larger photos of the memorial and its surroundings can be viewed on the pages Gedenkorte Europa 1939-1945 - Marijampolė Stadt and Information Portal to European Sites of Remembrance – Mariampol. Carlo Mattogno, Gli Einsatzgruppen Nei Territori Orientali Occupati. Parte II L"Azione 1005" (2017 Effepi Edizioni, Genova), p. 278. 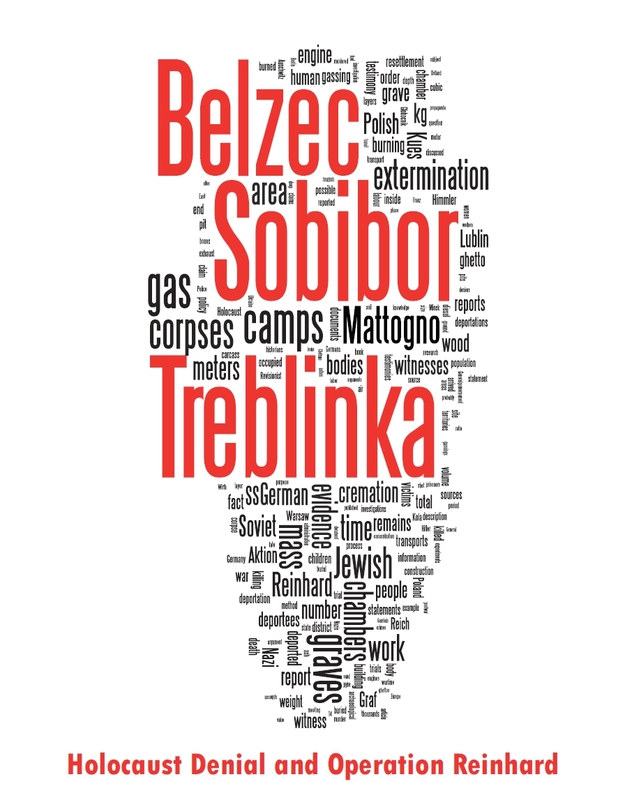 In the subsequent paragraph on the same page, Mattogno claims that in the HC white paper (Belzec, Sobibor, Treblinka. Holocaust Denial and Operation Reinhard. A Critique of the Falsehoods of Mattogno, Graf and Kues., by Jonathan Harrison; Roberto Muehlenkamp; Jason Myers; Sergey Romanov; Nicholas Terry), I "prudently dropped the matter" ("lasciò cadere prudentemente la faccenda") in my chapter about mass graves, even though there is a reference in note 25 on p. 97 to an article by "Revisionist" star Germar Rudolf and one Sibylle Schröder, in which these authors try to make the Einsatzgruppen look as mere anti-partisan fighters and, among other things, make much of the supposedly absent mass graves at Marijampolė. 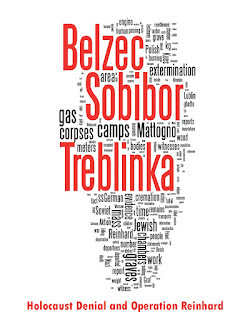 The respective chapter of the critique was written by one of my co-authors (and not by me, as Mattogno’s readers may be led to believe), and the critique’s chapter 7, which I wrote, was about the mass graves at the extermination camps Bełżec, Sobibór, Treblinka and Chełmno alone. Mattogno obviously didn’t read carefully enough, or then his memory is failing him. "Jewish execution site laid to rest", in The Baltic Times, 15 August 2008; "Construction halted at Lithuania mass grave site", in: Jewish Telegraphic Agency Archive, 15 August 2008. The former article is available online. The direct link to the latter article no longer works, but it is transcribed in the online article Lithuanian desecration of Jewish mass-grave from Holocaust halted. The JTA article contains a wildly exaggerated claim about the number of victims ("tens of thousands of Jews"). The only killings at Marijampolė besides the large massacre on 1 September were comparatively small earlier massacres. The following of these are mentioned in the 2nd Jäger Report: 7.7.41 – 32 male Jews; 8.7.41 – 14 male Jews and 5 communist officials (19 persons); 14.7.41 – 21 male Jews, 1 Russian and 9 Lithuanian communists (31 persons); 18.7.41 – 53 Jews (39 male and 14 female); 25.7.41 – 103 Jews (90 male and 13 female). Another 68 Jews were killed before 11 July 1941 by the Tilsit Gestapo. The Tilsit Gestapo’s massacre is mentioned in Operational Situation Report USSR no. 19 dated 11 July 1941 (translation in Arad, Yitzak, Shmuel Krakowski and Shmuel Spector, editors The Einsatzgruppen Reports, 1989 New York: Holocaust Library, pp. 16-19, online). According to the page Gedenkorte Europa 1939-1945 - Marijampolė Stadt and the Holocaust Atlas of Lithuania, these earlier executions, except for the killing of 68 Jews by the Tilsit Gestapo, took place in the Šunskai and Rudžiai forests, i.e. not at the site of the large massacre on 1 September 1941. There are separate memorials in each of these two forests. At the Ulm Einsatzgruppen Trial, two of the defendants were charged with having participated in the killing mentioned in OSR no. 19, but acquitted of that charge for lack of proof. The judgment mentions two witnesses who recalled having heard from others that Jews had been killed "by the Gestapo" in the Šešupę river valley, but couldn’t provide particulars about the "Gestapo" killers. As the witnesses’ sources wouldn’t necessary be able to tell Gestapo from Einsatzgruppen, and as the Šešupę river valley is not limited to the site of the massacre recorded by Jäger under 1 September 1941, it is not clear whether the "Gestapo" killings took place at that same site. Ground-penetrating radar can identify objects even below granite, according to a personal communication I received from GPR Expert Lawrence B. Conyers on 13 April 2017. A Google Maps view of the mass grave site in its current state can be generated at the bottom of the page Gedenkorte Europa 1939-1945 - Marijampolė Stadt. "Killing field found in Marijampole", in: The Baltic Times, 18.11.1999, online. Dieckmann, as above, pp. 151-155 (regarding the status of research and arrests and deportations during the first Soviet occupation, 1940-41; no out-of-hand massacres are mentioned) and pp. 301-303 (regarding massacres committed by retreating Soviet forces in June 1941). Soviet police, party and Red Army forces murdered over 400 prison inmates and about 700 (other) civilians in all of Lithuania in June 1941. According to Lithuanian historian Brandišauskas, there were 30 locations in which tortures, mutilations and murders by Soviet perpetrators took place, with numbers of victims ranging from a few to several dozen individuals. In Rainiai, a forest near Telšiai, 76 victims were murdered. The most deaths occurred among the political prisoners of the Pravieniškes camp near Kaunas, where about 230 prisoners and 31 public servants with their families were murdered. Dieckmann, as above, citing GARF, 7021-94-424, fl. 16. The number of victims stated in the same file, fl. 3-3R, was 7-8,000 Jews and 1,000 non-Jews. "Special Report of the Head of the ‘SMERSH’ Counterespionage Department of the 3rd Byelorusia Front General-Lieutenant Zelenin about the Activity of the Šaulis Nationalistic Organization" dated 3 September 1944 (The Tragedy of Lithuania: 1941−1944. New documents on crimes of Lithuanian collaborators during the Second World War / Трагедия Литвы: 1941−1944. Сборник архивных документов. − М:Алексей Яковлев, 2008. − 288 с. − Англ. ISBN 978-5-903588-01-5. Document 38, pp. 122-123). The massacre of September 1941 was also mentioned (with the wrong year, 1944) in the "Memorandum Report on the Acts of Atrocious Destruction of the Soviet People Committed by the Germans on the Territory of the Lithuanian USSR in the Vicinity of the City of Alytus" dated 18 October 1944 (Tragedy, Document 36, p. 109). The number shot was "not identified". Pavlaitis obviously meant to say Saint Liudvikas' day, which is 25 August. The witness may have mixed up the day on which the victims were herded into the stables and the day of the massacre. Dieckmann, as above, citing the Black Book of Soviet Jewry and LCVA R-1390-1-138, fl. 49-53; the quote is my translation from Dieckmann’s translation to German. Mrs. Kutorgienė’s diary entry is also quoted on the page Gedenkorte Europas 1939-1945 - Marijampolė Stadt. LCVA (Lietuvos Centrinis Valstybės Archyvas, Lithuanian Central State Archives) R-678-1-3-42 (facsimile, transcription, translation). LCVA R 627-1-150-35 (facsimile, transcription, translation). The automatic translator (I don’t read or speak Lithuanian) yielded the following text: "Concern: mass graves arrangement. In response to the Board's letter No. 20260 report that the mass graves that have been dried in the bottom of the stream, the incoming Šešupė, raised to a different location. There is currently no untidy mass graves." The literal machine translation makes no sense, but what is being referred to becomes clear when looking at the Report by the Sanitation Department of the Wehrmacht Local Headquarters in Marijampolė dated 3.4.1942. The mass graves by the Šešupė river were being flooded whenever the river‘s water level rose, and to put an end to that the graves were "dried" by "raising" them to a different location, namely a higher place where they would not be reached by floodwater. Of course graves cannot be moved; what they did was to remove the bodies from the original graves and place them in other graves further removed from the river’s water level. My understanding coincides with that of Dieckmann (Besatzungspolitik, p. 918), whose book I’m indebted to for pointing me to these and other documents. Moving massacre victims from one grave to another is not as unusual as it seems at first sight. It was done at massacre sites in the Bosnian War of 1992-95, including the site of the Srebrenica massacre. See Richard Wright, "Where are the Bodies? In the Ground. ", The Public Historian, Vol. 32, No. 1, pp. 96–107 (February 2010). The difference in regard to the removal of corpses from the Šešupę mass graves was the motive: at Srebrenica and other killing sites in Bosnia corpses were removed from the primary graves in order to hide evidence to the killings, whereas the Šešupę mass graves were "moved" to avert the threat of epidemic diseases resulting from contamination of the drinking water supply, such as typhoid fever. "A 72-year-old Jewish woman from Mariampol, Faiga Reibshtein, who escaped from there, together with her son, told the JTA today that the Germans had murdered four of her sons, fourteen grandchildren, four daughters-in-law and two great-grand children."